SG is a big fan of Van Cleef & Arpels jewelry, especially classic Alhambra flower collection. I have posted and gushed over these lovely pieces previously here, here and here. However, a new collection is having my heart palpitating with excitement. The workmanship for the new Effeuillage collection is exquisite, just like the Alhambra. 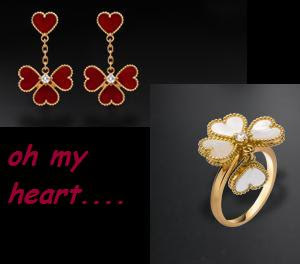 This collection reminds me of the Alhambra flower except hearts in place of petals. I just adore the charming little heart falling/dangling from the rest of the piece. These are available in rose or yellow gold. I think my heart is falling for the ring. You might ask, what is the price of love? The ring retails for $3330 and the earrings retail for $4800. Ladies, Valentine's Day is coming up, what do you think? The ring is pretty cute. The price of love is indeed, $3330, in fact I would sell my other half to get my mitts on that ring! sigh... i'm a fan of van cleef & arpels, too, but i'm not a fan of the price tag! I love the ring especially, too cute. My fav is the ring too. It's seriously too cute. I would be happy to receive the earrings or the ring or both :-). Van cleef perfume is pretty good too. Ohh I love the ring.